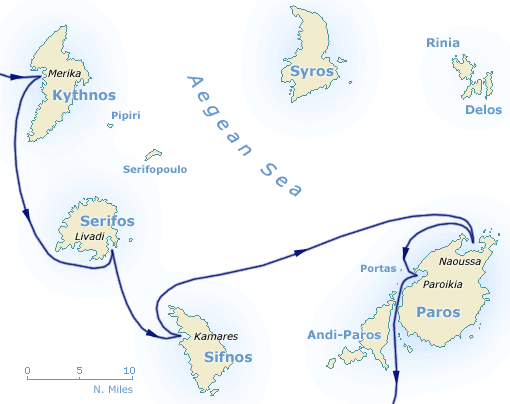 This time we decided to sail from Athens on a one-way bareboat charter to Milos (last two weeks of May). This is part three of the logbook that describes this adventure. Click on the thumbnails to see a larger 800x600 photo in a new window. Today, it was time to explore the inlands of Kythnos, so we rented scooters and helmets to match. We also tried to visit the Loutra spa, like we did last time when we visited Kithnos. But, although the hot springs still run, no visitors come to use it any more. Years ago we anchored here in Ay Irini bay (see photo) opposite the new unfinished marina. Although most travel books describe Kythnos as barren, due to the wet spring this year the fields were brightly coloured with an abundance of flowers. When we approached Livadia we got an excellent view of the magnificent chora looming over the bay. Yet, after a climb of 45 min we discovered that this chora is more interesting when seen from sea level. After the descent we had a nice fruit-de-mer diner at the waterfront. In the morning we set sail for Kamares on Sifnos Island but planned to explore some beautiful inlets in the west of Sifnos as well. The first one, Ay Yiourious, proofed an uninteresting place. Yet, just north of Kamares lays “Hidden bay” - so-called because it is very difficult to spot. Here the surroundings were quite a treat and we spent some good hours before proceeding to Kamares in the late afternoon. Once ashore we rented scooters and dealt with laundry and personal hygiene at the near camping site. We still had the scooters for the whole day and we commenced by exploring Apollonia, which is the main place on the island. From there we visited the lovely littoral village of Kastro and enjoyed multiple café frappés at the Remezzo music bar, that provided - besides music - excellent panoramic views. To Liotrivi Το Λιοτριβι (0248) 31246 - 32051. Due to un-greek like weather, life jackets, boots and dry suits made their appearance on deck, and even seasickness tablets were distributed for those doubting their abdomen. However, the pharmaceutical industry let us down with a low score of 5 crewmembers in misery. Mark even managed to spray the whole cockpit. But soon, the winds eased to 17 knots and ahead of us Anti-Paros appeared through the haze. Though we had planned to reach Naxos, we stopped at Naoussa, the little gem of Paros. In the harbour we used the laid mooring lines at the root of the mole. Early in the afternoon we anchored - under the watchful eyes of the ubiquitous nudists - close to the beach in crystal clear water in the north of Naoussa bay for a bit of a swim. Finally on our way, we made a commemorate circle around the notorious Portas rocks and took photos from all directions. Restaurant Parostia 0284-21926 regaled us with superb dishes in their palm garden. A sad day, as for five of us the holiday was over en hence they had to return to their home country - the Netherlands, leaving only Laura, Michiel and Diederik (me) behind on the Galaxy. No sailing for today, but some thorough exploring of Parikia.